Music: Thomas Helmore and Thomas Morley, eds., Music of the Appendix to the Hymnal Noted. (Novello, Ewer & Co., No Date, ca. 1870), #119, p. 128. Source: Rev. John Chandler, The Hymns of the Primitive Church (London: John W. Parker, 1837), Number 36, pp. 39-40. The mercies he will bring. And the new man put on! St. 2, L. 2. "A Virgin's Child must be:"
St. 2. L. 4. "To set His people free." St. 3. L. 3 & 4. And do not faithlessly despise. St. 4. L. 3. "And take His Body left below,"
May deeds of night be gone! The old man all be put away. The new man all put on! In Flesh made manifest. Amen. Sheet Music from Thomas Helmore and Thomas Morley, eds., Music of the Appendix to the Hymnal Noted. (Novello, Ewer & Co., No Date, ca. 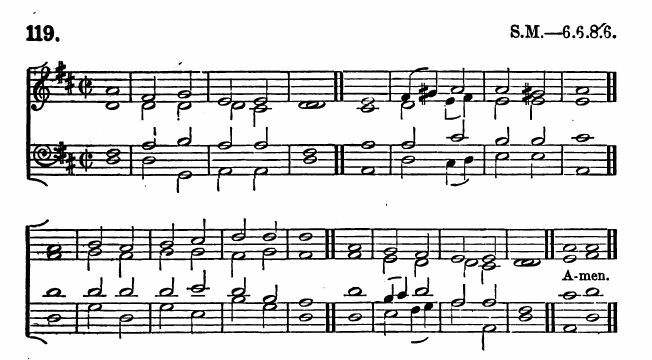 1870), Tune #119, p. 128.